Most of the students whom I’ve met in India, especially those who’re pursuing engineering have no idea what Arduino is, and what it does so here I’ve shared a introduction to Arduino from ‘arduino.cc’. There are also some videos of Arduino projects which I’ve shared, do watch them. 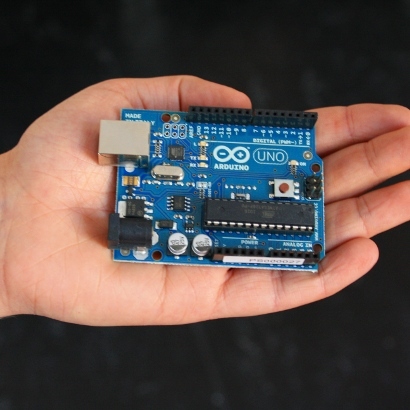 Arduino is basically a microcontroller. It’s a tool for making computers that can sense and control more of the physical world than your desktop computer. It’s an open-source physical computing platform based on a simple microcontroller board, and a development environment for writing software for the board. Open source and extensible software- The Arduino software and is published as open source tools, available for extension by experienced programmers. The language can be expanded through C++ libraries, and people wanting to understand the technical details can make the leap from Arduino to the AVR C programming language on which it’s based. SImilarly, you can add AVR-C code directly into your Arduino programs if you want to. Open source and extensible hardware – The Arduino is based on Atmel’s ATMEGA8 and ATMEGA168microcontrollers. The plans for the modules are published under a Creative Commons license, so experienced circuit designers can make their own version of the module, extending it and improving it. Even relatively inexperienced users can build the breadboard version of the module in order to understand how it works and save money. Getting Started with Arduino UNO. « Discovering life and creating species.